Due to the ever-growing amount of available data in modern information society there is a growing trend towards large and immersive displays both in industry and in science. Today, well known visualization and interaction techniques do not scale and are not applicable for these kind of modern output devices. Furthermore, it is becoming more and more unfeasible for anyone to oversee, much less understand the overwhelming amount of unstructured, multidimensional information he is confronted with. iACT aims at providing users with new, intuitive ways to make sense of normally unstructured and hardly comprehensible information, to share their insights with others and develop new ones by working as a team. 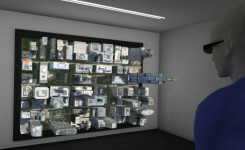 Thus, the vision of iACT is to research, develop and evaluate tools, strategies and metaphors to better understand and support ways to interact more natural and effectively with large, immersive displays.